Discover the 3 stars hotel - L'Hôste Hôtel : Photos, activities, restaurant, practice and access. 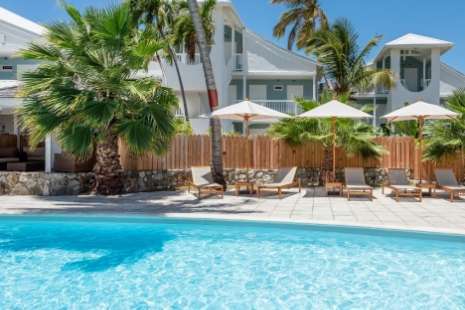 La Playa boutique Hotel invites you to relax and escape everyday life with a stunning holiday directly on the sands on one of the most beautiful beaches on the island of Saint Martin / St Maarten. Wi-Fi is available everywhere !! On the Orient Bay's beach, dicover the hotel's watersports. An outdoor swimming-pool in the heart of the hotel. The Playa Orient Bay is situated on the famous beach of Orient Bay, a natural marine reserve with its barrier reef, well-known for its sports activities. It's private beach is equipped with sun loungers and parasols made available to the hotel's guests. The hotel has a freshwater swimming pool surrounded by sun loungers and parasols. Situated in the center of the hotel, it is private and discreet, respecting all the safety conditions and offers you an area of peaceful tranquility. Come and discover our new restaurant! A new team manage by Bruno from the Dreams Bar Beach Restaurant & Thomas from the Astrolabe welcomes you to a renovated and redesigned (october 2016) to offer you the best catering and menu. Enjoy the unique Beach Bar ambiance and savor cocktails on the beach until sunset. Continental Buffet Breakfast from 7h00 to 10h00: Viennoiseries, fresh bread, toast, cereals, jam, fruit juice, fresh fruit, hot drinks, yoghurts. Eggs, pancakes etc… with extra charge. A laundry (€) is available near the hotel (10 mns by car). The rooms have a safe with a key or code. Wifi is included and available in all the public areas (restaurant, bar, reception and swimming pool) and also in the rooms. Free breakfast, business center with Internet access, meeting rooms, concierge. 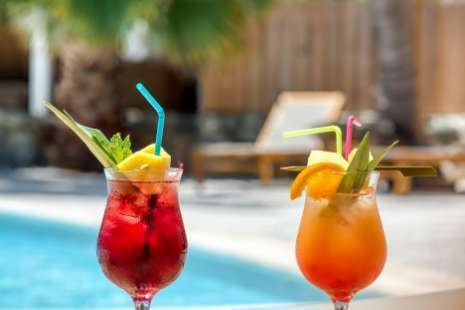 For any reservation, the RESORT FEES (including: parking, wifi, beach towel every day, bottle of water on arrival, deck chair and parasol) are 6 € per person, per day and free for children! Check in from 4 PM, check out until 11 AM. Reception open from 7 AM to 11 PM and security service during the night. An activity desk and a concierge service at the reception propose sightseeing tours. Car rental is available at the hotel. Quickly offers you different cars categories: city cars, SUV, berline and electric vehicle. *these rates including: insurances CDW - TP - PAI, unlimited mileage, government tax. The staff speak fluently english and spanish. Other languages are also spoken. Take the direction to Orient Bay in the North of the Island – when you arrive, then follow the directions to the Playa Orient Bay. - Flights with Air Antilles Express, St Barth Commuter, Air Caraïbes. If you arrive by sea, you can arrive in the various Marinas...the nearest is Anse Marcel. Bonne ambiance. Personnel aimable et accueillant. Je recommande vivement cet hotel. Nobody informed that front desk / restaurant closed at night. No place to buy snacks or drinks that day. No water last day of stay. Super séjour, très bon accueil dans un hôtel très bien tenu et offrant toutes les prestations. Même si l'hôtel était en travaux, nous n'avons eu aucune gêne de ce côté la, tout était très bien géré. Wifi down or did not work. Cleaning lady was grumpy and we didn't get our room cleaned on the last day. I understand there are renovations while it is not peak season, but otherwise La Playa was very comfortable and convenient. I loved the shower but only wish the toilet was in the same room as sink & shower. The kitchen was a little dated, but sufficient. Most importantly, the Staff was terrific! Very friendly, welcoming and helpful. Thanks! I loved the shower but some of the tiles had broken pieces that hurt if stepped on! Also noticed some rubbish (empty bottles/ cups, etc) around the grounds that were ot tended to during my stay. A great place to relax with excellent people. Excellent accueil, situation exceptionnelle, chambre rénovée très réussie. Mattress could be improved. Extra toilet paper in room would be good. We almost ran out. Sliding doors need to be able to be properly locked. Overall, the staff was wonderful and the room we stayed in (we requested a renovated room) was lovely.